Improved Sage ERP Accpac reporting features and no charge to use it! Create new views of your data. Click on the different views to see data organised in a different way. In the example below, AP Outstanding Transactions, Outstanding by Vendor Group, Outstanding with Aging, AP Outstanding by Vendor are views on the AP query, and AR Outstanding Transactions is the view on the AR Query. Create new charts of your data. Click on the chart to see the data represented graphically. In the example below Outstanding Aging Chart and Outstanding by Vendor group are two charts on the AP Query. Drag and drop the rows and columns to see data organised in a different way. In the example below you could swap the customer and customer goup dimensions, to see a list of customers by DateDueYear. Filter the underlying dimension data to see a filtered subset of your data. In the AR Query below you could filter out all credit notes. Create new facts to analyse based on calculated data. In the AR Query below you could rank your customers by amount due. 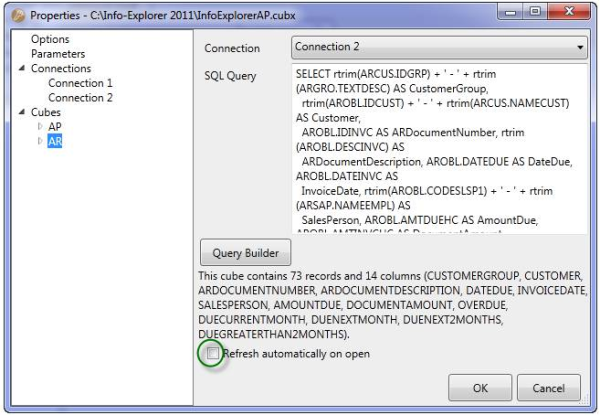 Create parameters for your queries to restrict the data retrieved into the cube. In the AR Query below you could restrict the customers by Sales Rep. Demonstration cubes are now available to Info Explorer Lite users (Don’t forget that any Sage Accpac customer on Version 5.4 and higher can use Info Explorer Lite with the demo cubes for FREE!). Equation can help you install Info Explorer Lite.